Open-platform steel baggage/coach No. 410 was built in 1914 by the Pullman Company. 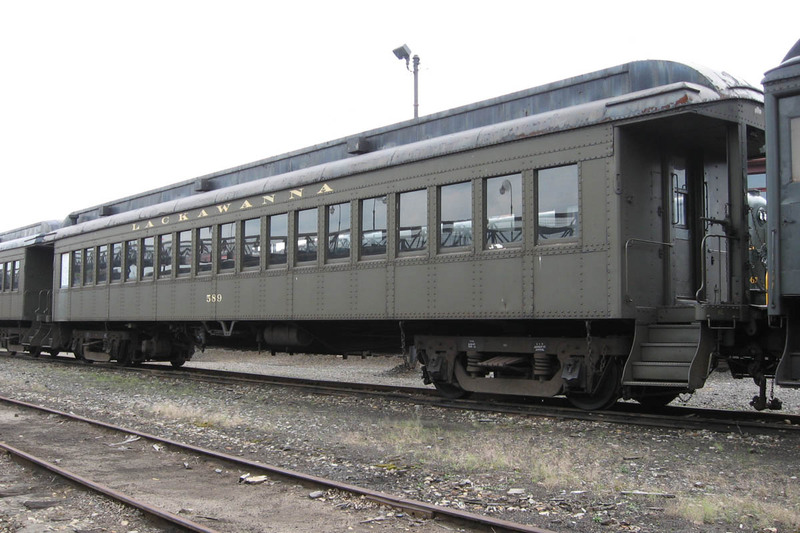 The car was built in Lot 4299 according to Plan 2849, with a combination of baggage storage (at the front of the car) and passenger seating - railroaders referred to this type of coach as a “combine.” The 410 was part of an order of 77 cars built for the Delaware, Lackawanna & Western Railroad (DL&W). All of the cars featured unique I-beam platform roof supports at each end, which earned them the nickname “Boontons,” as they were a familiar site along the DL&W’s Boonton Branch through Boonton, NJ. Hundreds of thousands of commuters rode these cars to and from their places of employment for over four decades. By the early 1960s, many of the cars were considered surplus, and the Erie Lackawanna, the successor to the DL&W, began selling them to tourist railroads and museums. Combine 410 was purchased by Historic Red Clay Valley Inc., in the early 1960s for $700, and was moved to downtown Wilmington for restoration. 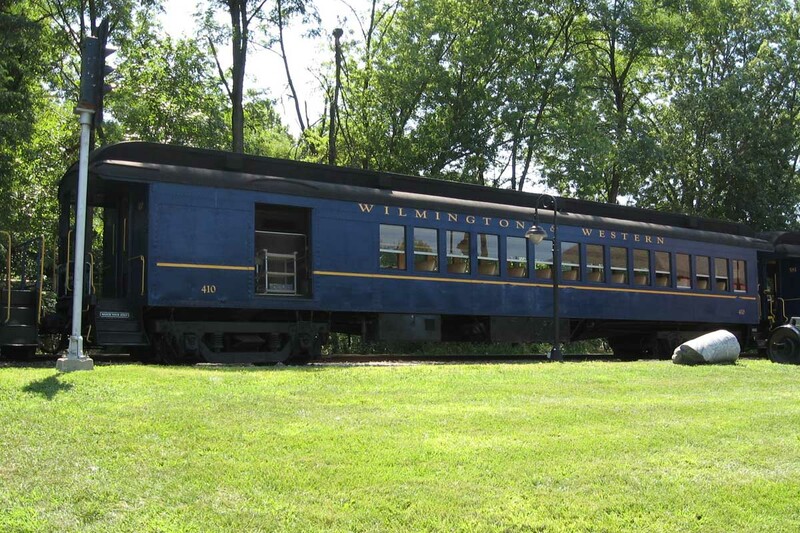 The car returned to Wilmington & Western rails and entered tourist service in May 1966. Combine 410 weighs 110,900 lbs., has a seating capacity of 56, and retains its original Hale & Kilburn walkover seats. Closed vestibule steel coach No. 442 is a former Pennsylvania Railroad Class MP54 locomotive-hauled passenger coach built in 1912 by the Pennsylvania’s Altoona Shops. The car was converted between 1950 and 1951 into a multiple-unit (MU) electric power car and reclassified MP54E6. Four General Electric 630 traction motors were installed during the conversion, giving it a top speed of 91 mph, and the ability to run without a locomotive. The car weighed 139,390 lbs. and had seating for 72 passengers. Coach 442 and her sisters could be found throughout the Pennsylvania’s vast commuter rail system. The MP54 cars were retired by 1978, although they were sometimes brought out of retirement when more modern equipment had difficulty operating in the snow. 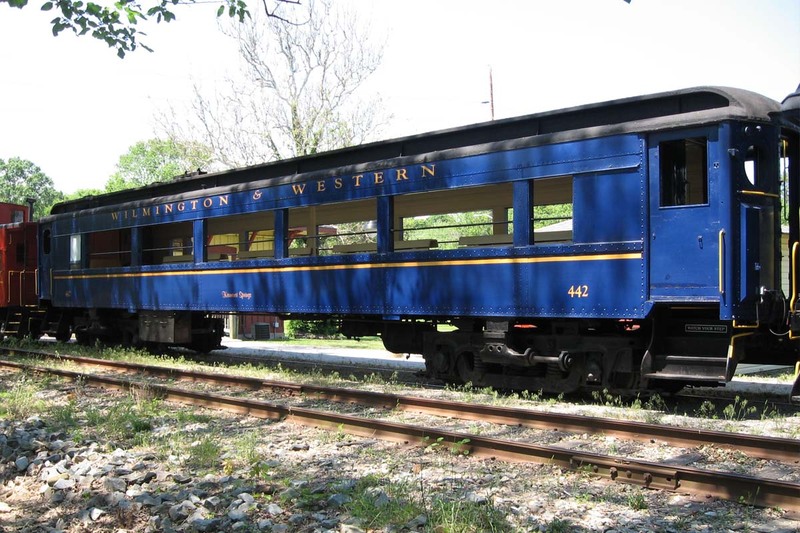 The car arrived on Wilmington & Western rails in 1988 and was converted into an open-air car by our shop crew in the late 1990s. It entered service as an open-air car on May 23, 1999. The car is named for the Kiamensi Spring, which was a mineral spring located a short distance west of Greenbank Station. The spring was famous in the late 1700s and early 1800s for its mystical healing abilities. No. 442 is one of only three known MP54 coaches in tourist service. Open-platform steel coach No. 571 was built in 1914 by the Pullman Company. The car was built in Lot 4298 according to Plan 2848, and was part of an order of 77 cars built for the Delaware, Lackawanna & Western Railroad (DL&W). All of the cars featured unique I-beam platform roof supports at each end, which earned them the nickname “Boontons,” as they were a familiar site along the DL&W’s Boonton Branch through Boonton, NJ. Hundreds of thousands of commuters rode these cars to and from their places of employment for over four decades. But by the early 1960s, many of the cars were considered surplus, and the Erie Lackawanna (EL), the successor to the DL&W, began selling them to tourist railroads. 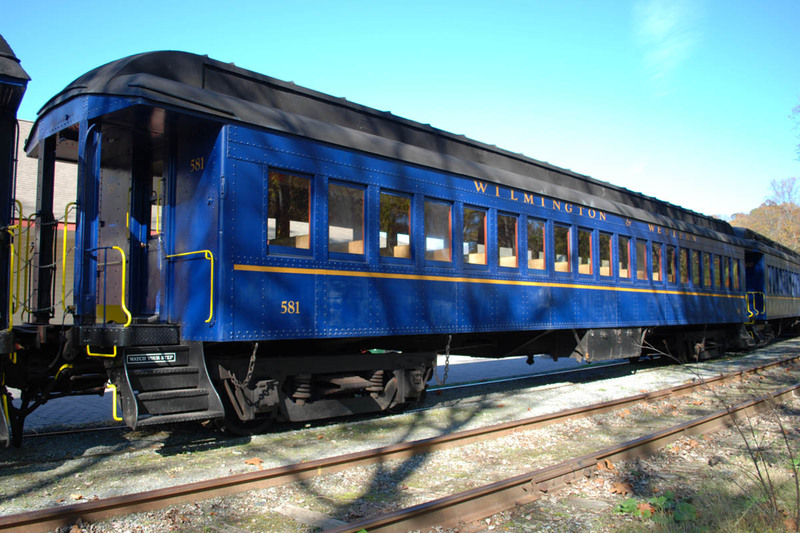 Alto Smith, a member of Historic Red Clay Valley Inc., purchased the car from the EL in the early 1960s for use on Delaware’s new Wilmington & Western steam tourist line. The car was moved to downtown Wilmington for restoration and entered tourist service in May 1966. Smith’s son sold the coach to the railroad in 1995. The car retains its original exterior roof ribs (which were removed from many of the cars during their lifetime), as well as its original Hale & Kilburn walkover seats. Open-platform steel coach No. 581 was built in 1914 by the Pullman Company. The car was built in Lot 4298 according to Plan 2848, and was part of an order of 77 cars built for the Delaware, Lackawanna & Western Railroad (DL&W). All of the cars featured unique I-beam platform roof supports at each end, which earned them the nickname “Boontons,” as they were a familiar site along the DL&W’s Boonton Branch through Boonton, NJ. Hundreds of thousands of commuters rode these cars to and from their places of employment for over four decades. But by the early 1960s, many of the cars were considered surplus, and the Erie Lackawanna, the successor to the DL&W, began selling them to tourist railroads and museums. Coach 581 was purchased by Historic Red Clay Valley Inc., and was moved to the former Jackson & Sharp Company shop buildings at East 7th Street in Wilmington for restoration. The car returned to Wilmington & Western rails and entered tourist service in May 1966. Coach 581 weighs 108,000 lbs., has a seating capacity of 72, and retains its original Hale & Kilburn walkover seats. 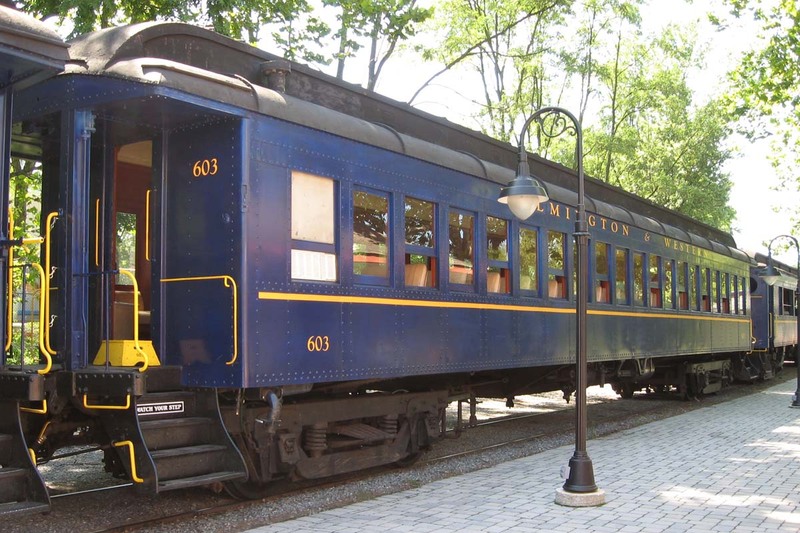 Many Lackawanna Boonton coaches survive in tourist service, mostly in the eastern United States. Several Boontons are in operation at Steamtown National Historic Site in Scranton, PA, and have been restored to their original colors of Pullman Green with gold lettering. Sister coach 589 in operation at Steamtown NHS. Open-platform steel coach No. 603 was built in 1915 by the Pullman Company. The car was built in Lot 4298 according to Plan 2848, and was part of an order of 77 cars built for the Delaware, Lackawanna & Western Railroad (DL&W). All of the cars featured unique I-beam platform roof supports at each end, which earned them the nickname “Boontons,” as they were a familiar site along the DL&W’s Boonton Branch through Boonton, NJ. Hundreds of thousands of commuters rode these cars to and from their places of employment for over four decades. But by the early 1960s, many of the cars were considered surplus, and the Erie Lackawanna, the successor to the DL&W, began selling them to tourist railroads and museums. 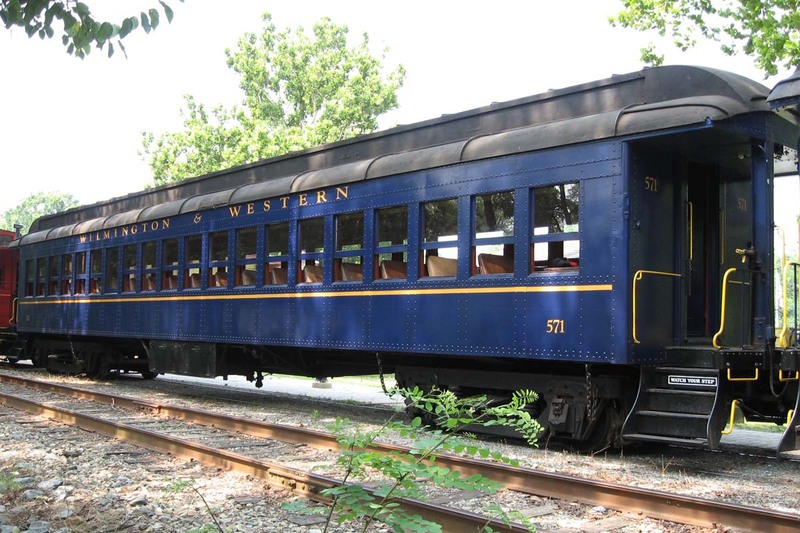 Coach 603 was purchased for $700 by Historic Red Clay Valley Inc., and was delivered to the Wilmington & Western at Yorklyn, DE, on September 8, 1961, and was then moved to downtown Wilmington for restoration. The car returned to Wilmington & Western rails and entered tourist service in May 1966. Coach 603 weighs 108,000 lbs. and has a seating capacity of 72. The car retains its original exterior roof ribs (which were removed from many of the cars during their lifetime), as well as its original Hale & Kilburn walkover seats. Closed vestibule steel coach 6795 was built in 1930 by the Pullman Company for the Delaware, Lackawanna & Western Railroad (DL&W) as multiple-unit electric commuter coach No. 2548. The car was originally self-propelled and had a top speed of 67 mph. The 2548 and her 140 sisters spent over 30 years hauling commuters between Hoboken and the northern New Jersey suburbs. In 1960, the DL&W merged with the Erie Railroad to form the Erie Lackawanna. The DL&W's 2500-series cars were renumbered into the 3500-series, so the 2548 became Erie Lackawanna 3548. 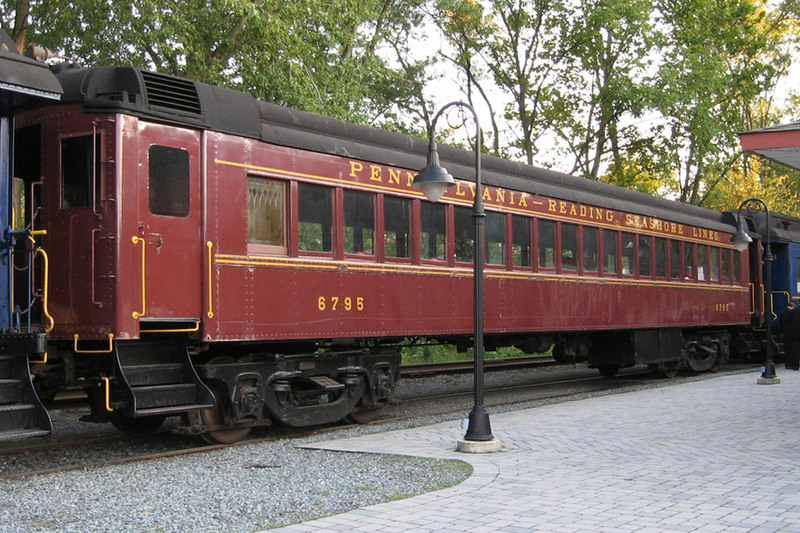 The coach was later purchased by Philadelphia radio personality Tom Moran, who stored the car on a siding in Woodstown, NJ. Moran had a great interest in the Pennsylvania-Reading Seashore Lines (PRSL), and painted the car in that road’s paint scheme. He also renumbered the car to 6795, which is one digit higher than the last PRSL coach built. The 6795 was purchased by the Wilmington & Western on January 14, 1991, and remained in storage until early 2006, when it was moved into our shops for restoration and conversion to a parlor car.